Each year the Central Services Classified Senate gives out two scholarships – one to a Foothill student and one to a De Anza student. Although as staff we may not interact with students every day we are committed to student success and see our scholarship as a vehicle for us to acknowledge and celebrate the hard work of our students. A shining example of classified staff’s commitment to students happened earlier this year when an ETS staff member (Linda Koyama) was participating in the Bridge to Bridge run, and decided to see if any other classified employees were willing to sponsor her. Her moment of action was met with enthusiasm, as colleague after colleague signed up to sponsor her. This resulted in a donation of over $1,000 to the Central Services Classified Senate Scholarship. The suffix –ing represents “action” and ultimately when giv–ing takes place it propels students in motion to achieve their academic goals. As leaders of Central Services Classified Senate, it is our wish and our hope to be able to provide the scholarship on an ongoing basis. Your donation will directly impact the lives of our students in profound ways. Please consider giving a donation. By helping us reach our match you will secure future scholarships for future students. 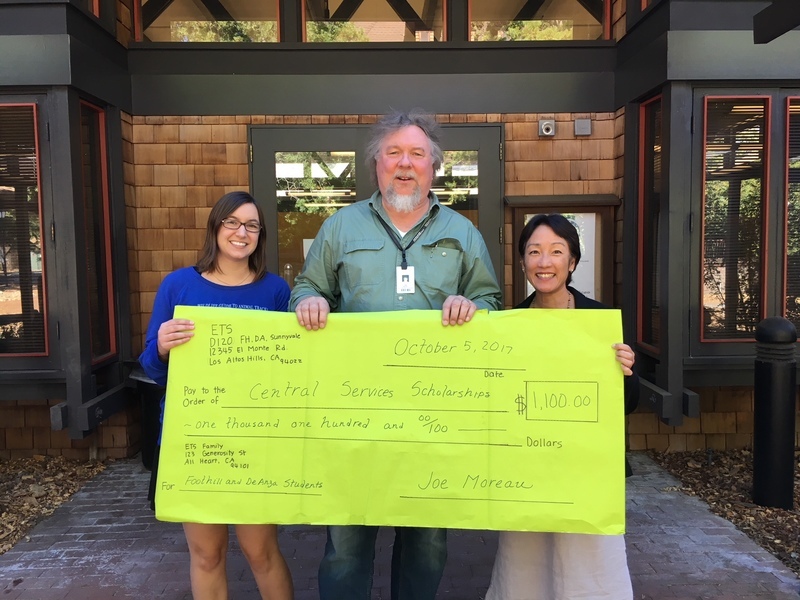 From right to left: ETS staff member Linda Koyama, Vice Chancellor of Technology Joe Moreau and Central Services Classified Senate President Lindsay West.